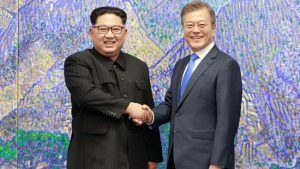 Over the last 20 years, the relationship between South and North Korea has ebbed and flowed based on elections in the South and the leadership of the North. There have been many past South-North dialogues, but none has led to substantial progress towards peace. This time seems to hold more promise, but the two countries may not cross the finish line unless the Trump administration becomes more invested in this historic opportunity. South Korean public support for the US-ROK alliance could decline significantly if future generations of South Koreans come to believe that the US has thwarted their aspirations for peace on the Korean Peninsula. At the historic inter-Korean summit in Pyongyang in September, South Korean president Moon Jae-in declared that the “Korean Peninsula must be turned into a land of peace, free of nuclear weapons and nuclear threats for good.” The crowd of 150,000 North Koreans roared in a standing ovation to Moon’s statement, “A Korean Peninsula free of war has begun to take shape.” North Korea declared it would consider taking measures such as permanently dismantling the Yongbyon nuclear facilities only if the US takes corresponding measures, and both Koreas agreed to dismantle border posts, reconnect railroads, reopen the Kaesong Industrial Complex and establish a permanent meeting place for separated families. They even agreed on a joint bid for the 2032 Summer Olympics. Throughout the summit, the two leaders reaffirmed their resolve to move forward to achieve what they agreed in their first summit last April in Panmunjom. As a first-generation Korean American citizen living in the United States for the past 30 years, I am cautiously optimistic that the two Koreas have reached a turning point in the on-again, off-again reconciliation process. Among the first generation of my fellow Korean Americans, I encounter great excitement and anticipation over the prospect of an everlasting peace on the Korean Peninsula. As children who were raised at the beginning of the Korean War, we have endured the greatest impact and are therefore the most heavily invested in ensuring an enduring peace. I want my homeland, the ancestral lands of my children and grandchildren, to be a safe place for them to visit. My mother was originally from Pyongyang, North Korea. Growing up, she would feed us Northern style food like dumplings and Korean pancakes. So, she brought that influence from her hometown to us. As we got older, she wanted to go back and felt so sorry that she couldn’t. I remember she told us before she passed to burn any documents such as the deed to her property, because she felt she could never go back. As her son, I can only feel sad that she was not able to go back to her hometown one last time before her passing. Because of this, I want my children and grandchildren to understand their heritage and make sure they do not forget their Korean identity and are proud of it. Peace on the Korean Peninsula will help strengthen the Korean economy and ensure that Korea has a continued voice in the politics of the Asia-Pacific region, something they would be able to take great pride in. When I speak to my children (28 and 25 years old) about the conflict, they also want peace on the Korean Peninsula. They were born and raised in the United States and are culturally more American than Korean. Moreover, they never experienced the pains of a divided Korea. Nonetheless, they still understand what it means to be Korean American—and the Korean identity is still something that is strong and resonates within them. The same can be said about the youth in Korea, whether they grow up in South Korea or the United States. But each successive generation of Koreans and Korean Americans will be increasingly removed from the conflict. As the memory of it recedes in their consciousness, they will not be as culturally invested in their Korean heritage as their parents, and they will have never known a life or people who have been directly affected by the conflict. Many foreign policy experts in the US fail to recognize that the US is losing the hearts and minds of Koreans, especially the younger generations. They question why the US is so hesitant to support peace in the Korean Peninsula. The alliance forged in the Korean War is still strong, but it will not last forever. A recent survey showed that many South Koreans believe the latest summit was successful and in its aftermath, President Moon’s approval rating and support for his party got a bump. The public began to see a pathway to peace. The swelling popular sentiment for peace in South Korea has trickled over into the Korean American community in the US. Korean Americans understand the level of mistrust the US government harbors toward the North because of the checkered history of US negotiations with North Korea. However, relations between nations, like relations between people, require compromise and hard work to strengthen, a reality that the US government and the American public often forget in their impatience for immediate results. We also understand the frictions that differences over trade have engendered in US relations with South Korea. But the political, economic and geopolitical benefits of a strong US-ROK relationship should outweigh trade considerations. Korean Americans believe that now is the time for the US government to make a greater investment in the well-being and peace of a friendly nation. This will require greater support from the Trump administration for South-North reconciliation, including accelerated economic integration, and more coordinated engagement with both Koreas. We believe that a peaceful Korean Peninsula will help lead to more economic growth for both the United States and the two Koreas. Additionally, Kim Jong Un was educated in western schools while living in a western lifestyle. We genuinely believe he is looking to modernize North Korea’s struggling economy and raise the standard of living of the North Korean people. If he is successful, the South Korean economy will get a major boost. For example, the population of working adults in South Korea is expected to drop significantly through 2037. North Korean laborers, if greater South-North economic integration can be achieved, would help to mitigate the negative economic effects of these labor shortages and sustain a healthy rate of growth for the South Korean economy. As the president of the National Unification Advisory Council (NUAC) Chicago Chapter, I’m hopeful we can achieve an enduring peace on the Korean Peninsula that will make both Koreas more secure and more prosperous. Korea was able to grow with the help of the United States following the Korean War. That partnership, though it had its ups and downs, has led to the close relationship the two countries have today. With a greater US investment in Korean peace, the partnership between Korea and the United States will continue to grow stronger. A strong Korea is in the national security interests of the United States.